An interest rate swap is a contract between two counterparties who agree to exchange the future interest rate payments they make on loans or bonds. These two counterparties are banks, businesses, hedge funds, or investors. The most common is the so-called vanilla swap. It's when a counterparty swaps floating-rate payments with the other party's fixed-rate payments. The floating-rate payment is tied to the Libor, which is the interest rate banks charge each other for short-term loans. Libor is based on the fed funds rate. A smaller number of swaps are between two counter parties with floating-rate payments. To make it easier to explain, the counterparty that wants to swap its floating-rate payments and receive fixed-rate payments is called a receiver or seller. The counterparty that wants to swap its fixed-rate payments is the payer. The counterparties make payments on loans or bonds of the same size. This is called the notional principle. In a swap, they only exchange interest payments, not the bond itself. Also, the present value of the two payment streams must also be the same. That means that over the length of the bond, each counterparty will pay the same amount. It’s easy to calculate the NPV for the fixed-rate bond because the payment is always the same. It's more difficult to predict with the floating rate bond. The payment stream is based on Libor, which can change. Based on what they know today, both parties have to agree then on what they think will probably happen with interest rates. A typical swap contract lasts for one to 15 years. It's called the tenor. The counterparty can terminate the contract earlier if interest rates go haywire. But they rarely do in real life. 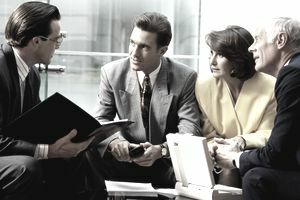 In the past, receivers and sellers either found each other or were brought together by investment and commercial banks. These banks charged a fee for administering the contract. In the modern swap market, large banks act as market makers or dealers. They act as either the buyer or seller themselves. Counterparties only have to worry about the creditworthiness of the bank and not that of the other counterparty. Instead of charging a fee, banks set up bids and ask prices for each side of the deal. ACME Anvil Co. pays ACME Catapult Corp. 8 percent fixed. ACME Catapult pays ACME Anvil the rate on a six-month Treasury bill plus 2 percent. The tenor is for three years with payments due every six months. Both companies have a Notional Principle of $1 million. The receiver may have a bond with low interest rates that are barely above Libor. But it may prefer the predictability of fixed payments even if they are slightly higher. Fixed rates allow the receiver to forecast its earnings more accurately. This elimination of risk will often boost its stock price. The stable payment stream allows the business to have a smaller emergency cash reserve, which it can plow back. Banks need to match their income streams with their liabilities. Banks make a lot of fixed-rate mortgages. Since these long-term loans aren’t paid back for years, the banks must take out short-term loans to pay for day-to-day expenses. These loans have floating rates. For this reason, the bank may swap its fixed-rate payments with a company's floating-rate payments. Since banks get the best interest rates, they may even find that the company's payments are higher than what the bank owes on its short-term debt. That's a win-win for the bank. The payer may have a bond with higher interest payments and seek to lower payments that are closer to Libor. It expects rates to stay low so it is willing to take the additional risk that could arise in the future. Similarly, the payer would pay more if it just took out a fixed-rate loan. In other words, the interest rate on the floating-rate loan plus the cost of the swap is still cheaper than the terms it could get on a fixed-rate loan. Hedge funds and other investors use interest rate swaps to speculate. They may increase risk in the markets because they use leverage accounts that only require a small down-payment. They offset the risk of their contract by another derivative. That allows them to take on more risk because they don't worry about having enough money to pay off the derivative if the market goes against them. If they win, they cash in. But if they lose, they can upset the overall market functioning by requiring a lot of trades at once. There are $421 trillion in loans and bonds that are involved in swaps. This is by far the bulk of the $692 trillion over-the-counter derivative market. It's estimated that derivatives trading is worth $600 trillion. This is 10 times more than the total economic output of the entire world. In fact, 92 percent of the world's 500 largest companies use them to lower risk. For example, a futures contract can promise delivery of raw materials at an agreed price. This way the company is protected if prices rise. They can also write contracts to protect themselves from changes in exchange rates and interest rates. Like most derivatives, these contracts are OTC. Unlike the bonds that they are based on, they are not traded at an exchange. As a result, no one knows how many exist or what their impact is on the economy. Should You Invest in Mutual Funds or Stocks?